As authorized under the Clean Water Act, the NPDES controls water pollution by regulating stormwater , which discharges directly into surface waters. New Castle County, DelDOT and six municipalities — Bellefonte, Delaware City, the Town of Elsmere, the City of Middle town, the City of New Castle, and the City of Wilmington — are Phase I co-permittees for the discharge of stormwater separate storm – sewer system (MS4) in New Castle County as authorized under the NPDES and the laws of the State of Delaware. 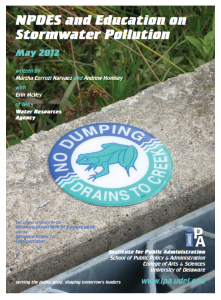 This report provides guidance for DelDOT and the co-permittees to achieve the education and outreach requirements of the NPDES permit. It intends to make the education and outreach efforts more effective and meaningful for New Castle County, DelDOT and the six municipalities regulated under the permit. Recommendations on how to achieve the stormwater-education requirements in the eight Target Areas defined in the permit. Stormwater Education and Outreach Plan, as required by the NPDES Phase I permit.